Here, chicken is poached with lemon grass, shredded and mixed with a sweet-sour dressing of concentrated chicken broth, lemon juice, sugar, ginger and chilli. Tossed with cucumber and basil, it's then piled on crisp lettuce. Put the chicken breasts in a small pan with the lemon grass, ginger and salt, and enough water to cover. Bring to the boil, turn down the heat, cover and simmer for 10 minutes. Remove from the heat and allow the chicken to cool in its own broth for about an hour. Meanwhile, combine the dressing ingredients and leave to infuse. Remove the chicken breasts from the broth and remove the skin and bones. Set aside the meat and return the skin and bones to the broth. Boil the broth fiercely until reduced to a couple of tablespoonfuls of liquid - about 20 minutes. Allow to cool a little before straining out the bones and whisking the reduced stock into to the dressing. Meanwhile (this is optional but pretty and delicious), pick out a dozen of the best basil leaves. Heat 2 tbsp olive oil over a high heat, and fry the basil leaves until crisp but still green - about two minutes. Set aside. Slice the chicken breasts diagonally into bite-sized slivers. Combine the chicken with the matchsticked cucumber, salad onions and the dressing. Toss with the remaining basil leaves. 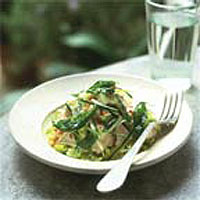 Arrange the salad leaves in four dishes, pile on the chicken salad and top with the reserved fried basil leaves. Serve at room temperature.